Come with us to Tranquil Repose, where they keep your dying loved ones in suspended animation...until Davros turns them into food to solve a intersteller famine to earn money to build a Dalek army out of humans so he can fight other Daleks... Hey, look! Peri's wearing pants! It's Revelation of the Daleks, our Sixth Doctor stop on our road to the 50th Anniversary. What's short tempered, grandiloquent, and difficult to look at? 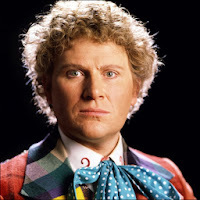 The Sixth Doctor! This week we take a look at Colin Baker's aborted foray into the TARDIS. What makes this Doctor tick, and what makes so many Americans hate him so much. All this, and more, on the 102nd episode of The Sonic Toolbox. Poor Tegan. The Doctor just can't seem to find Heathrow for her. Maybe she should get Nyssa and Adric to fly her there, they seem to be able to pilot the TARDIS with pin point accuracy. And so it goes in the Fifth Doctor story, The Visitation. We're reviewing it this week, dontcha know. The link to the Paul McGann audition clip is in last weeks show notes. PETER DAVISON!!!!! OK, we've made it to Daisy's Doctor. 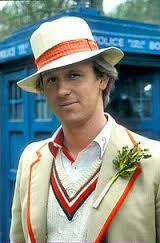 Once known as Tristan Farnon, the Fifth Doctor is stern, testy, adorable and plaguedby many companions all at once. This week we on our road trip we stop off in the mid 1980s to visit this Doctor in beige. So the White Guardian hijacks the Doctor, saddles him with a young upstart companion and sends him off on a mission. And thus we get The Ribos Operation. This week we take a look at this first story of the Key to Time series, the first Romana story, as we continue on our road trip to the 50th Anniversary. Come sample this Fourth Doctor dish with us.